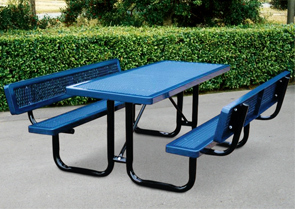 This thermoplastic coated rectangular outdoor table with optional backrests is one of our specialty tables. Providing the utility of an outdoor table and the comfort of a park bench, this portable outdoor table with round corners creates the ultimate outdoor dining experience. 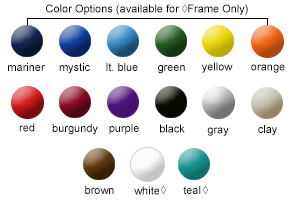 Available in the color options shown below, in a lightly textured Polyethylene finish. Expanded Steel Top & Seats. 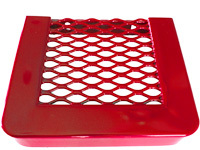 For extra safeguarding, Surface Mount Clamps, In-ground Mount Posts, and Sleep Inhibitor Bars can be ordered to help protect against the possibility of undesired movement or usage of the outdoor table.